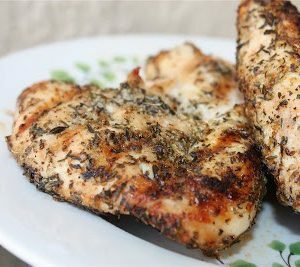 This Italian Herb Grilled Chicken recipe is a summer staple – pair it up with salad or pasta, or serve on it’s own. It’s delicious! In a small bowl, combine oregano, thyme, basil, garlic, salt and pepper. Set aside how much you will use for chicken, save the rest in air tight container for future use.